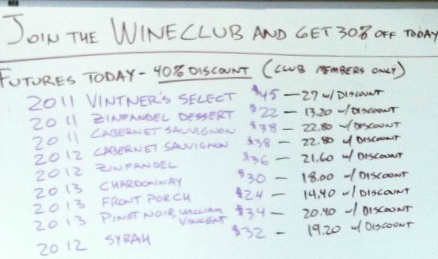 Last weekend, Villa del Monte Wine Club members had the opportunity to buy wine futures, by the case, at a 40% discount. Buying wine futures refers to buying wine after it is made, but before it is bottled and labeled. The wine will be held in the barrel at the winery for another year and then bottled, labeled, and ready for pick up in April 2015. If you were not able to visit us over the weekend, Wine Club members can still order case lots of futures until May 15, 2014 by contacting us. You can mix and match 12 bottles to create a custom case if you prefer.